Tesla Motors is building the Gigafactory which will double the world production of Lithium Ion batteries from 2013 levels. With much of the rest of the automotive industry jumping on the Electric Vehicle (EV) bandwagon, there some are concerned that that Lithium supplies will not be able to meet the demand from EV batteries could be constrained. Part of the concern may stem from the fact that the identified Lithum resources had stayed flat for over a decade. However with projections for EV growth now suggesting a rapid demand ramp, it appears that people are again actively prospecting for Lithium. 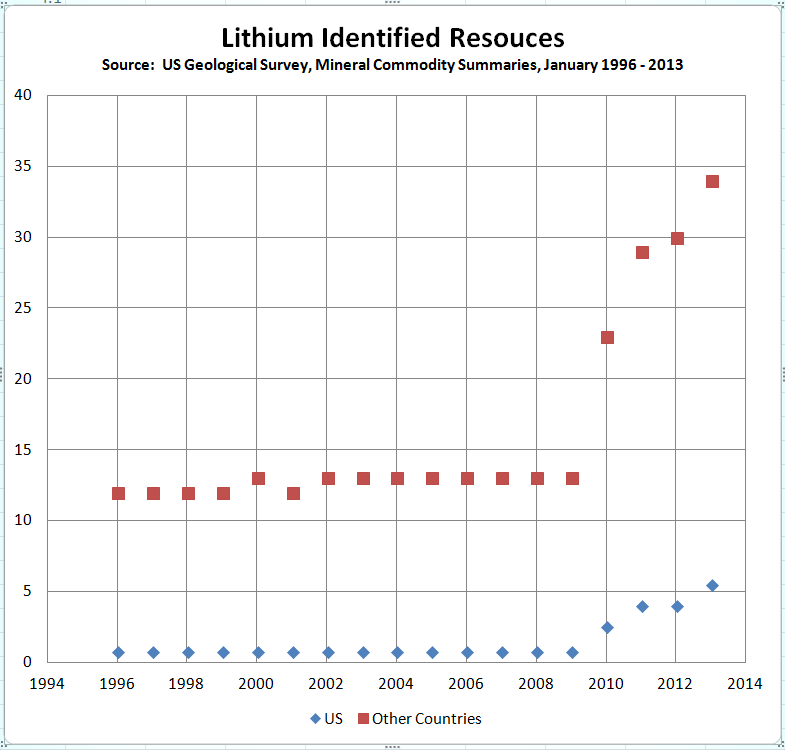 The graph above shows how lithium supplies languished from 1996 through 2009. Around 2010 EVs started increasing in volume and demand for Lithum, for use in batteries, began growing. This triggered demand which incentivized growth which has continued unabated. The above graph is from USGS statistics that are available HERE. 1) Potential massive new supplies here. IThese appear to be identified subsequent to the work below. If they or similar ones pan out then it appears likely that we can source most or all of our lithium domestically and may even become an exporter. 2) This paper written prior to the above discovery suggests sufficient supplies through 2100. 3) This link suggests that current known deposits are sufficient but there are political problems that may arise due to location of large supplies in countries not necessarily well aligned with US interests. It references #2 but #1 was discovered after 2 and 3. 4) This, older look at supplies indicated that it looks like we will not run out of Lithium. 5) Here is a helpful post that makes the case that there is sufficient lithium for many years to come. 6) Here is a recent Motley Fool article that looks at the impact of the Gigafactory on global lithium supplies and suggests that there will be a supply crunch. 7) Here is a paper that discusses the expansion of Li supply. 8) Here is information on a large discovery in Mexico that is promising. Here is a June 2015 status press release. – Here is a good post on Lithium supply by another blogger. It includes info on lithium per battery and about increasing supply vs demand. – Additional information on availability of Lithium. This entry was posted in EV PEV, Path to a New Paradigm, US Energy Competitiveness and tagged economics, Electric Vehicle, Energy Storage, EV, PEV, Remedy to Intermitency, Storage. Bookmark the permalink.